Commanding a hill overlooking the beautiful Barmouth bay, the location of our Hotel couldn't be better. Of course, our Guest House isn't the only attraction around so we've collated a list of nearby places we think our guests would like to visit. These include ancient castles, steam trains, and of course, mile upon mile of beautiful beaches, with the majestic wild splendour of the Snowdonia mountain range and the surrounding National Park. Ty’r Graig Castle is situated high above Barmouth on the edge of Snowdonia National Park. Snowdon sits only 20 miles north, the Cadair Idris just across the Mawddach Estuary to the South, and many equally beautiful hills in between. This area is second to none for those who wish to get off the beaten track and discover the rawness of the Welsh terrain. Ty’r Graig Castle is on Llanaber Road about 1/2 a mile out of Barmouth, going towards Harlech on the A496. The Postcode for Satellite Navigation system is LL42 1YN. The nearest mainline train station is Barmouth Station. Barmouth is well served by bus connections via Harlech and Dolgellau. Details are available from the tourist information office located at the railway station. There are many attractions within easy reach of Barmouth, including off-road cycling, canoeing, boating, steam railways, and historical castles. 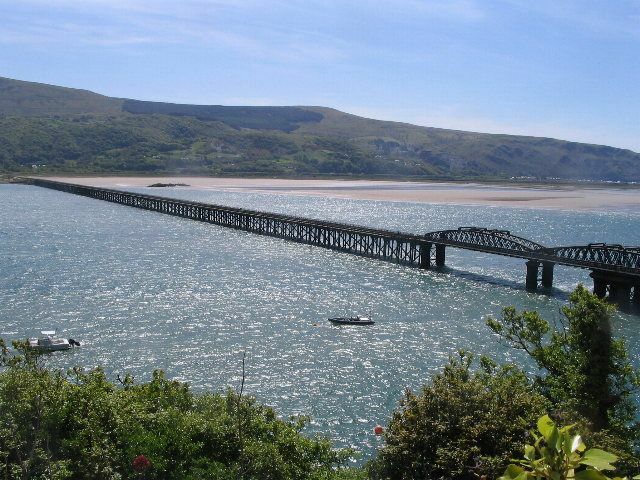 Barmouth Railway Bridge is a 5-minute walk from town, offering an exhilarating walk over the estuary or take a train over the bridge towards the town of Tywyn. Barmouth Market is located next to the Dragon Theatre and takes place every Thursday, as well as most Sundays and bank holiday Mondays. 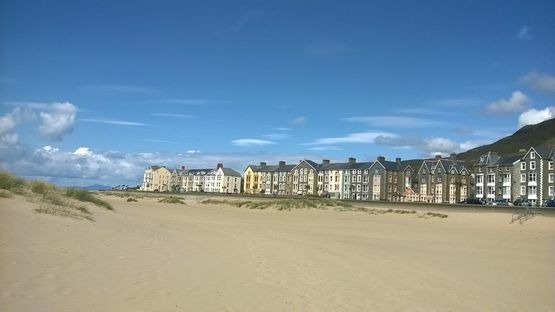 The excellent sandy beach has recently been awarded the prestigious blue flag. We advise to not bathe near the harbour, where red flags indicate danger. The Ty Gwyn Museum is located above Davy Jones' Locker, and tells the story of the nearby wreck of 1709, and of the salvage operation. Complete with a well-preserved relic. The Mawddach trail from Dolgellau to Barmouth is a stunning multi-use path, following the disused railway line along the edge of the Mawddach Estuary in Southern Snowdonia. The trail has featured on the TV show Julia Bradbury's Railway Walks. Sitting in the Mawddach Estuary across from Barmouth, Cadair Idris is Wales’ highest mountain outside of the Snowdon range. Caernarfon Castle was the birthplace of the first Price of Wales in 1284 and the investiture of Prince Charles in 1969. The castle holds many exhibits for everyone to enjoy. The visitor centre contains a pictorial history of Barmouth’s lifeboat station plus artefacts from the lifeboats. There are also pictures of Barmouth in the Victorian era, the visitor centre also houses the RNLI souvenir and gift shop. Harlech Castle sits in a spectacular location, giving the illusion that it has grown from the rock it's perched upon. 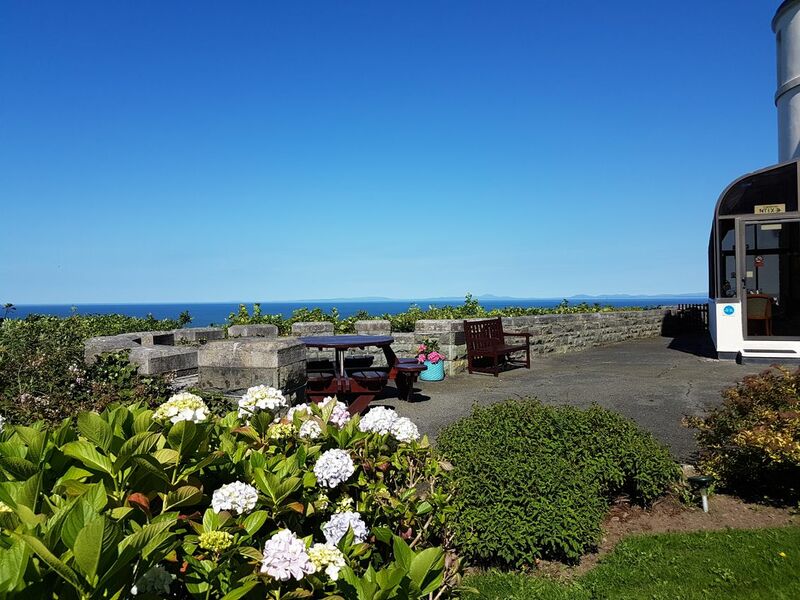 It offers great views of the land and sea, with a watchful eye over Snowdonia. The village of Portmeirion is set on its own private peninsula on the southern shores of Snowdonia. Portmeirion is the work of architect Clough William-Ellis, who wanted to demonstrate a naturally beautiful place could be developed without spoiling it. The eco-centre features working examples of sustainable living, renewable energy, environmentally responsible building, energy conservation, organic growing, and composting. The castle stands on the headland between two beaches and is considered a prominent landmark of North Wales. This 13½-mile train journey takes you from the harbour of Porthmadog, to the town of Blaenau Ffestiniog. The historic train climbs over 700ft from sea level into the mountains, passing through pastures, forests, and past lakes and waterfalls. The journey will involve horseshoe bends, even a complete spiral all the while clinging to the side of the mountain or tunnelling through it. Now known as Borth Wild Animal Kingdom, the zoo offers a varied collection of exotic animals, with most coming from pet rescue centres, the RSPCA, other zoos, pet shops, and unwanted or abandoned pets. Dolwyddelan Castle is a stronghold built by the Norman or English forces, as well as being a fortress of native Welsh princes. The award-winning Aberystwyth Arts Centre is the largest arts centre in Wales, with a wide-ranging programme of events and activities across all art forms. The Ceredigion Museum & Gallery is housed in the former theatre and cinema, The Coliseum, and is considered one of the most beautiful museums in Britain. This hour-long excursion takes you along the shores of Llyn Padarn in the heart of Snowdonia, allowing you to fully experience the timeless appeal of the narrow-gauge steam trains. Fully experience the highest mountain in England and Wales, Mount Snowdon. Travel up the mountain is available on Britain’s only rack and pinion railway. The Segontium Roman Fort overlooks the Menai Strait, with the fort dating back to circa 77AD. This was when Julius Caesar completed the conquest of Wales, through the capture of the Isle of Anglesey. The castle was initially intended to be a place of royal residence and a seat of government for North Wales by King Edward I, that was emphasised by the birth of the first English Prince of Wales in 1284. The visitor centre is set in 920 acres of moorland and forest of the Denbigh Moors, within 35 miles and 38 miles of Wrexham and Bangor respectively. This local history gallery captures the development of Llanidloes over the last 3 centuries, topics include the history of the market hall, civic events, and both World Wars. Anglesey is home to Wales' largest marine aquarium, housing over 150 species for you to get up close and personal with. Plas Newydd is the ancestral home of the Marquess of Anglesey, this country house portrays their humble beginnings during the reign of Henry VIII. Opened in 1903, the railway is a vital link for the rural communities in the area to the town of Welshpool. The tight curves and steep gradients allow for an exhilarating experience through the countryside. These two religious sites are within close proximity of each other in the countryside west of Corwen. Rug Chapel is an example of a minimally altered 17th-century chapel, with Llangar believed to be even older. Penrhyn Castle is a prime example of early 19th-century, Neo-Norman architecture, built by the Pennant family from their profits on Welsh slate and Jamaican sugar. The Strata Florida Abbey perfectly preserves the spirit of remoteness, adopted by Austere Cistercian monks who sought remote places to practice their religion. Situated above the River Conwy, the Bodnant Garden sits on ground sloping to the south west looking across the valley towards the Snowdonia range. The Newton Textile Museum offers visitors a wealth of knowledge, with the building it's situated in being a fine example of a 19th-century weaving shop. Built by Edward I, it was intended to be part of North Wales’ ‘iron ring’ of castles, but the castle remains unfinished to this day. Settled in the mouth of the Marteg Valley in the Cambrian Mountains, Gilfach is unique in showcasing a variety of habitats including high moorland, enclosed meadows, oak woodland, and an upland river. Contact us for more information on local attractions and transport to our castle accomadation.